Native wedding bands traditionally have two animals that represent a couple's spirit and relationship. You can select the animals that match your personalities from our Native Design Chart below. These bands are available in 10 Karat, 14 Karat and 18 Karat, in yellow or white gold. 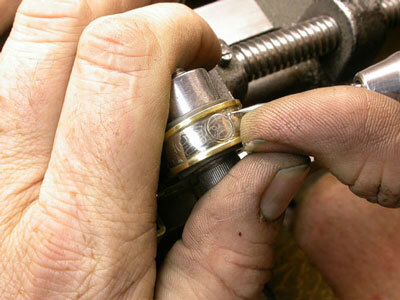 Choose 6 millimeters, 7 mm or 8 mm in width for your ring. These widths allows us enough room to layout your animals. Each band is rounded on the inside for your comfort. Diamonds set in the eyes is available for additional sparkle. A sketch of your custom design will be provided in advance so you can approve your own personal ring design. The following is what we need to complete a presentation and provide a free quote for you. - What animals would you like hand engraved on the ring? Traditionally there are two animals face to face representing two clans uniting. - What finger sizes do you need? - Would you like white or yellow gold? - Would you like 10 Karat, 14 Karat or 18 Karat gold? - Would you like a matched pair? - Do you want your wedding date or a secret message engraved inside the ring? - Would like your animals to have diamond set eyes? Fill out the REQUEST ORDER FORM and include the above information. We must have this information to prepare your quote. Call toll free 877-717-7226 or local 604-872-8226 to answer questions. The Elder Kinsman, Bear teaches the legends and the dances. Bear is always respected and treated as a high ranking guest. Symbol of great wealth and prestige for the owner. Given at Potlatches, also used as currency. A symbol of power and prestige, Eagle represents friendship and peace to all. The voice of the people, symbolizes innocence, stability, and communication. Considered to bring good luck. The joyful messenger, when a hummingbird hovers near, you will receive a message of healing. The communicator and highly regarded guardian of the sea. The Native word for whale means "Those who travel together". Protector and guardian of people of the earth. Moon Spirit watches over us and can change the way we feel. The trickster, the Creator. Raven rescued the sun and placed it in the sky so the world would have light. He put the trees on the land and fish in the water. This magical creature opened the clam shell to release man. Salmon is the life source, the provider of food for all animals and humans. The first salmon of the yearly run is held in the highest regard, spawning salmon are also revered. The Sun Chief is the provider of healing energy and life. Put into the sky by Raven, the rays are means of our travel between earth and sky. This mythological creature, most powerful of all the spirits, lives in the mountains. He has lightning sticks under his wings and hunts whales. He rolls the thunder, when he blinks his eyes flash lightning. Wolf is a positive symbol and is very family oriented. They mate for life and share all responsibilities equally. Wolves travel together and are the land equivalent of the Whale. Rabbits symbolize fertility, sentiment, desire and changes to the Earth in Spring. New life, new beginnings, creativity and creation are his attributes. Beaver symbolizes belief in our dreams. Build as if the dream is your reality. Change the course of your life flow by structuring a goal to physical reality. Reminds us to be diligent but take time to play. A) Design: Select animals for design? B) Ring size: What is your finger size? C) Width of ring: Which millimeter width, 6 mm., 7 mm., or 8 mm. wide? D) Gold type: Gold preference - 10 Karat, 14 Karat or 18 Karat? - Yellow gold or White gold?